Produced from 100 percent Pinot Noir, sourced from 10 different crus located mainly in the South and North areas of the Montagne de Reims — including top sites Ambonnay, Bouzy and Tours-sur-Marne — this attractive and structured Champagne is aged for a minimum of five years. It’s one of the best selling rosé Champagnes in the world and rightfully so — that strawberries and cream character is easy to appreciate. 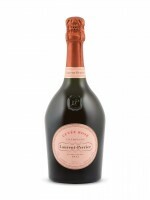 More importantly, Laurent-Perrier Cuvée Rosé has improved over the years — with more texture and verve than ever. Highly Recommended.